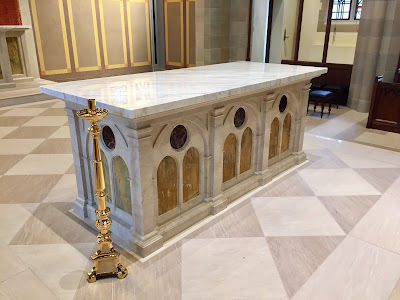 Many thanks to Mr Mark Cousineau for providing us with this description of the recent restoration of the Chapel of St Turibius at the Pontifical College Josephinum. This post is reproduced from his company’s blog, Henninger’s Herald, with their permission and that of the various other firms involved in the project. St Turibius Chapel at the Pontifical College Josephinum in Columbus, Ohio recently underwent a dramatic restoration project, the aim of which was to show the true beauty of the chapel’s architecture, with a special emphasis on artwork and craftsmanship, while focusing the congregation’s attention on the Eucharist. 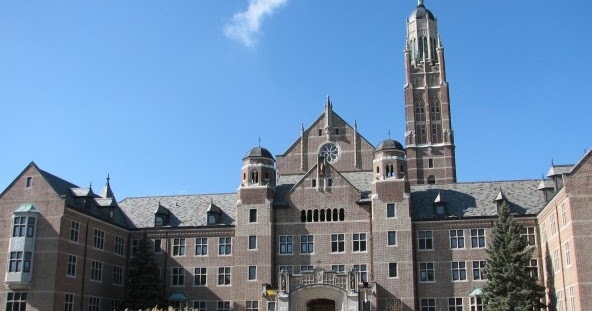 The Josephinum is one of only 15 Pontifical seminaries in the world, the only one outside of Italy. 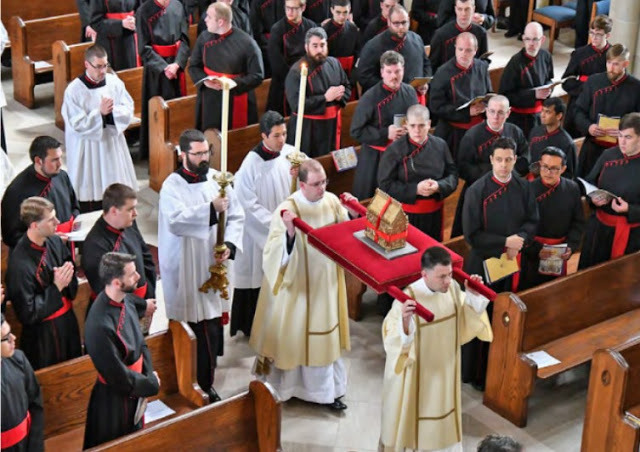 Since it has Pontifical status, this seminary has a special distinction. Completed in 1932 and designed by architect Frank A. Ludewig, the complex is an architectural marvel. Its tower is a recognizable landmark on the northern side of Columbus, visible from miles away. 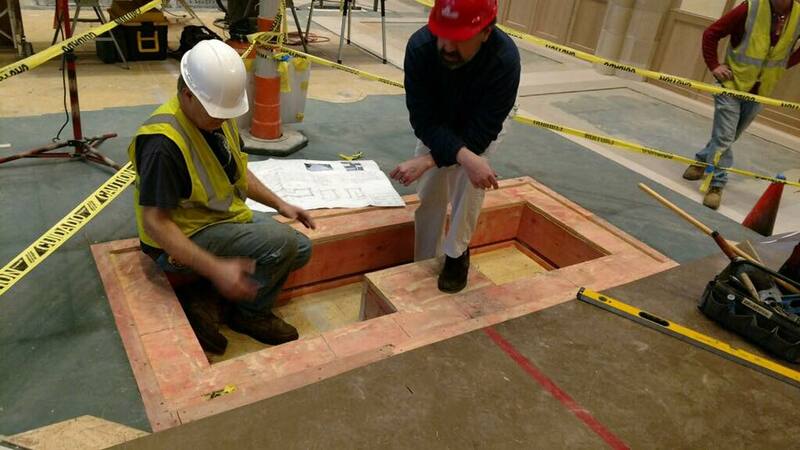 Architect William Heyer of Columbus, Ohio, has been working with the Josephinum since 2004 on various restoration projects. He has provided architectural consulting for a new roof, structural masonry, student residences, other housing quarters, and the St Rose Chapel. 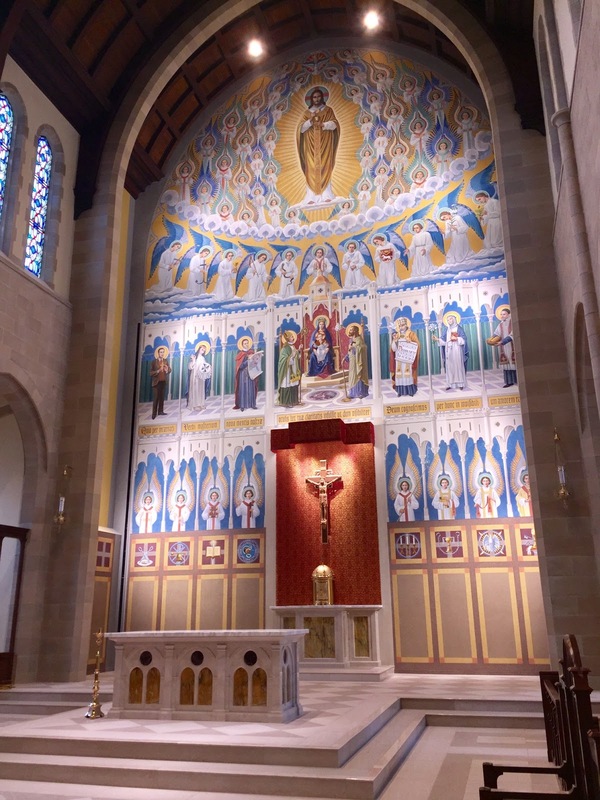 The restoration of the St Turibius Chapel was the Josephinum’s largest, and most important undertaking. 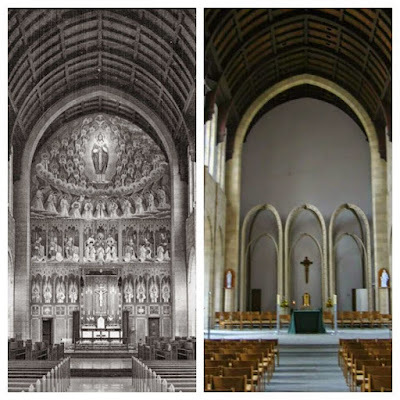 Archive photo before the 1989 renovation, and after. 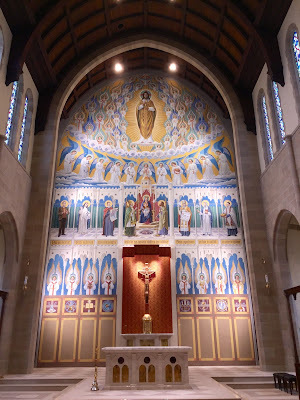 A main feature of the chapel for many decades was its large mural, designed and painted by Gerhard Lamers circa 1936. 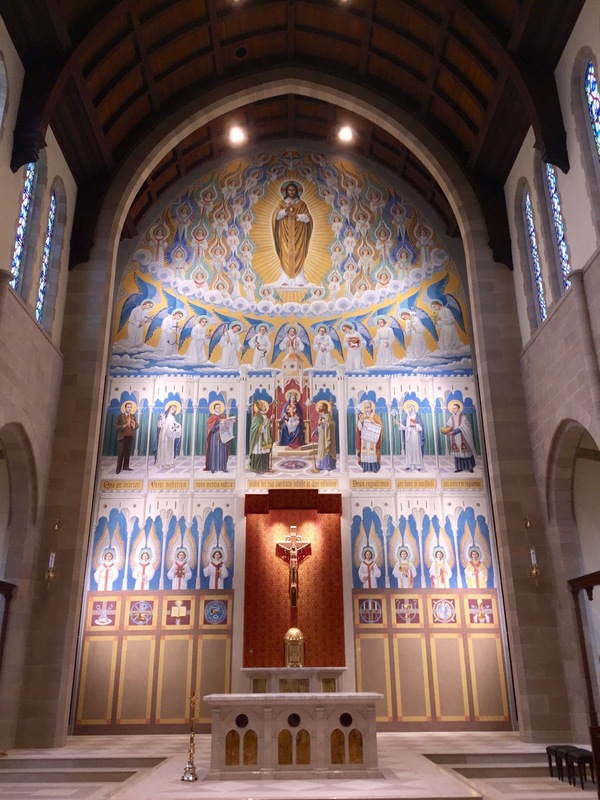 Since it was painted on an exterior wall, the mural deteriorated after each of the chapel’s three renovations, in 1936, 1945, and 1953. It was covered over during a 1989 renovation, hidden from site and unable to be restored. A studio with a high degree of artistic talent and a history of grand, religious projects was needed to create the mural to take its place. 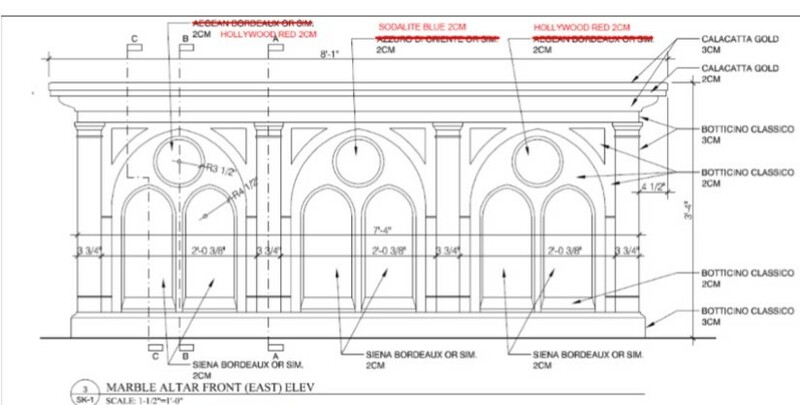 Evergreene Architectural Arts of Brooklyn, New York was selected by the Pontifical College Josephinum. The new mural is a celebration of Lamers’ work, with his original design intent and colors. It was finalized with the assistance of William Heyer, and two consultants from the Josephinum staff, Fr. John Allen, the Vice President for Advancement and Director of Alumni Relations, ) and Fr. Douglas Martis, Associate Professor and Director of Sacred Liturgy. The altar of sacrifice and tabernacle stand were designed by William Heyer, who visited Henninger’s in Cleveland with Frs Martis and Allen to discuss the project with Henninger’s marble fabricator, Renato Campi of The Italian Marble Company. 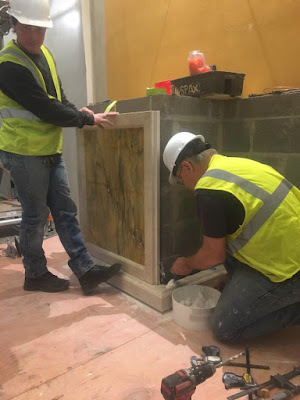 At Henninger’s warehouse, the species of marble were selected for the two altars: Bottacino Classico body, with Rosso Levanto and Giallo Siena inset panels, and mensas in Calacatta Gold. Color rendering of altar of sacrifice after selection of marble species. 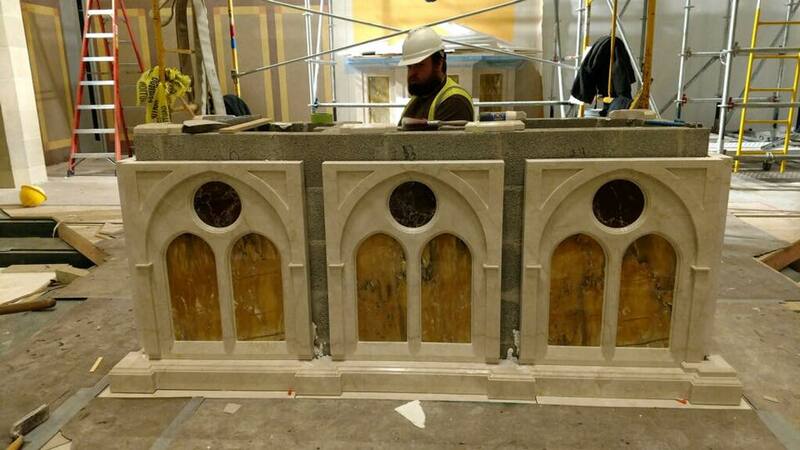 The altars were fabricated by The Italian Marble Company in Carrara, Italy. Altars and marble flooring was shipped from Italy to Ohio for on site installation. Since St Turibius is on the 3rd floor of the seminary, lifting the crates up and inside of the building were a challenge. Henninger’s crew performed the installation of the altars in about two weeks. 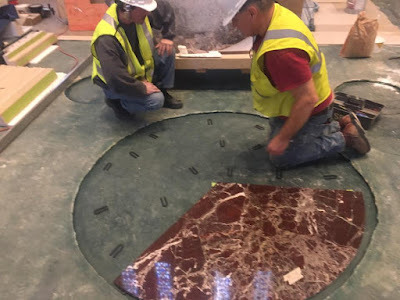 Overseeing the installation, and the entire restoration project was Ruscilli Construction Company. Henninger’s foreman, Jerry Klimo and Architect, William Heyer planning the installation from the site of the altar. 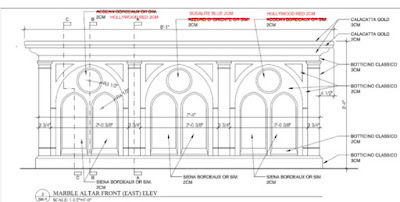 Other important improvements include a new floor plan which allows for more seating, a better liturgical placement of the altar, a new porcelain tile floor, with marble steps, risers, and medallions, enhanced handicap accessibility, and improvements to the sound system and energy efficient lighting. A reliquary being carried into the church for installation in the altar during the dedication ceremony. 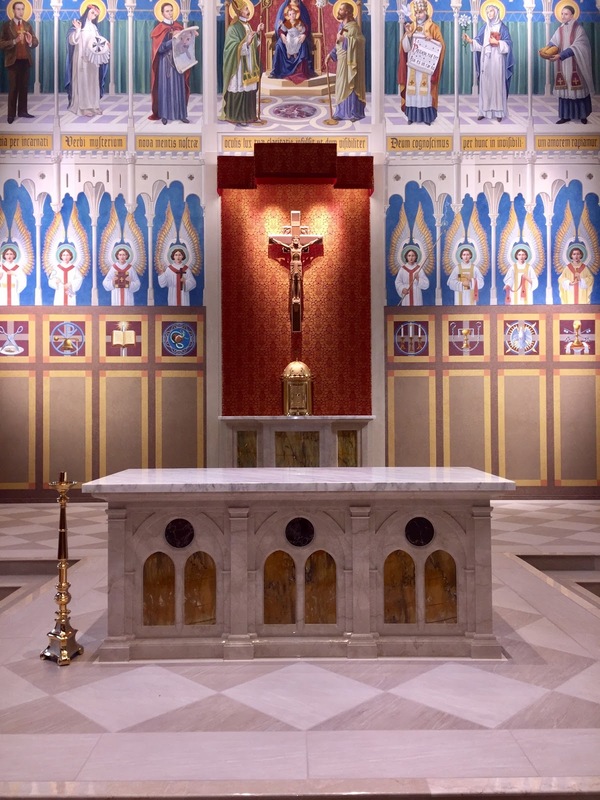 The chapel and altar were dedicated on April 24 by His Excellency, the Most Rev. Christophe Pierre, the Apostolic Nuncio to the United States, and Chancellor of the Josephinum. 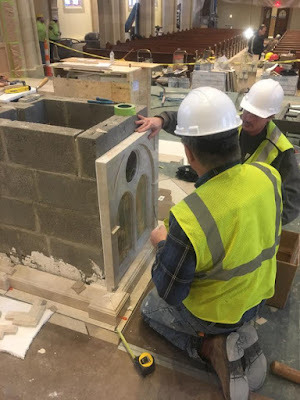 “The restored chapel will further the integration of a dynamic prayer life which is focused around the altar and the Paschal mystery,” said Msgr. Christopher J. Schreck, the college’s rector/president. It was an honor and thrill for Henninger’s to work on such an amazing project. The “before and after” pictures tell a part of the story. The rest of the story lies in the hundreds of smiling faces as they entered the restored Chapel for the first time after the project’s completion. 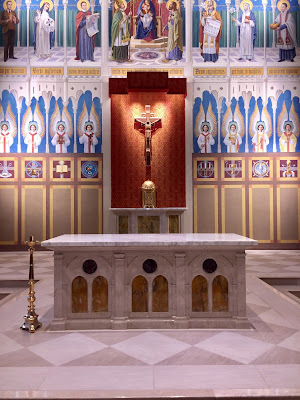 Such a historic Chapel in such an important Seminary deserves world class attention. We were proud to offer such attention and very grateful at the opportunity.